Good food isn't hard to come by when you have good recipes. 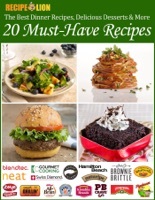 The recipes in this free eCookbook, The Best Dinner Recipes, Delicious Desserts, More 20 Must-Have Recipes, are fun, exciting, and delicious. You'll find a variety of dishes with every turn of the page.